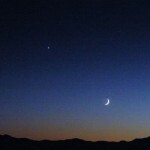 The lunar eclipse January 31 offers scientists a chance to see what happens when the surface of the moon cools quickly. 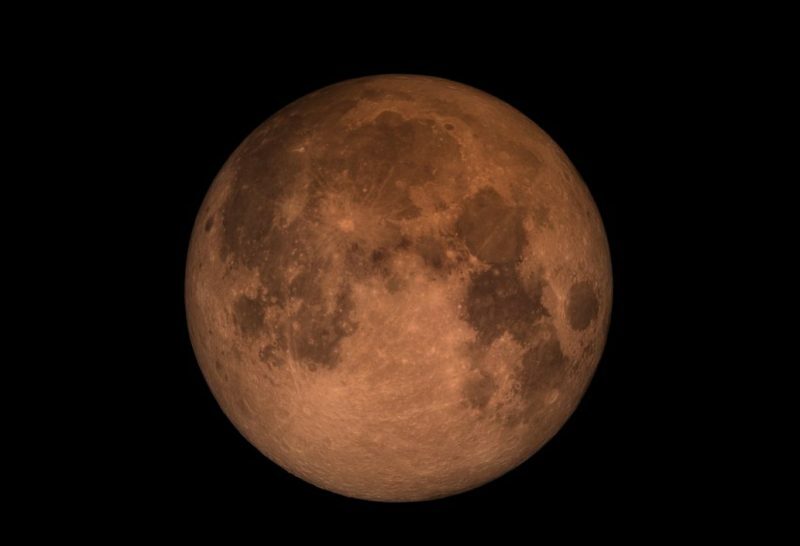 The moon takes on a reddish hue during a lunar eclipse. Image via NASA’s Goddard Space Flight Center. The lunar eclipse on January 31, 2018, will give a team of scientists a special opportunity to study the moon using the astronomer’s equivalent of a heat-sensing, or thermal, camera. Three lunar events will come together in an unusual overlap that’s being playfully called a super blue blood moon. The second full moon in January will take place on the 31st, making it the first Blue Moon of 2018. It also will be considered a supermoon — one that appears slightly larger and brighter than usual because it occurs when the moon is near its perigee, or the closest point in its orbit to Earth. In addition, a lunar eclipse will take place in the morning on January 31, temporarily giving the moon a reddish color known as a blood moon. For the researchers, the eclipse offers a chance to see what happens when the surface of the moon cools quickly. This information will help them understand some of the characteristics of the regolith — the mixture of soil and loose rocks on the surface — and how it changes over time. During a lunar eclipse, the temperature swing is so dramatic that it’s as if the surface of the moon goes from being in an oven to being in a freezer in just a few hours. 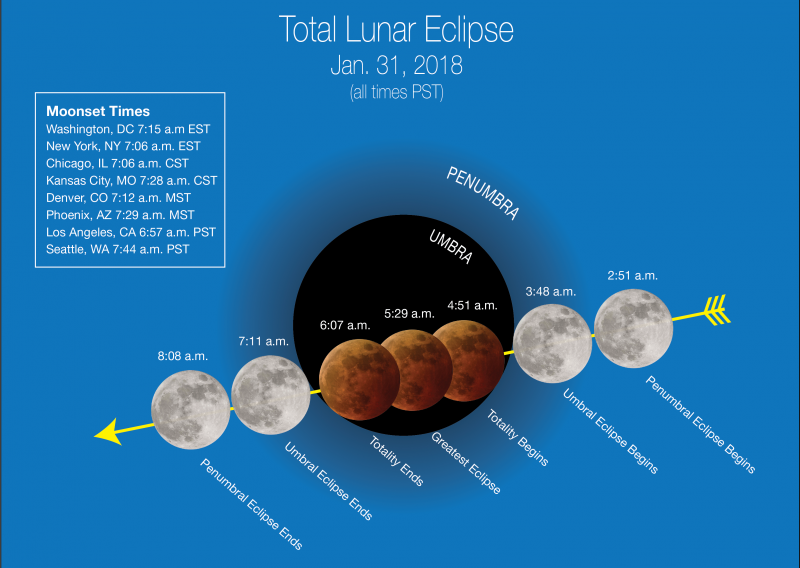 Stages of the January 31, 2018, “super blue blood moon” (weather permitting) are depicted in Pacific Time with “moonset” times for major cities across the U.S., which affect how much of the event viewers will see. 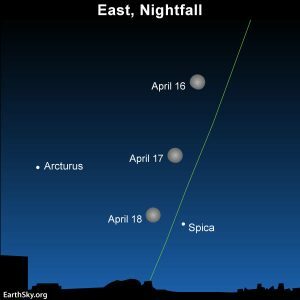 While viewers along the U.S. East Coast will see only the initial stages of the eclipse before moonset, those in the West and Hawaii will see most or all of the lunar eclipse phases before dawn. Image via NASA. Normally, the transitions into and out of darkness, and the temperature changes that go with them, are spread out over the course of a lunar day, which lasts 29 1/2 Earth days. A lunar eclipse shifts these changes into high gear. 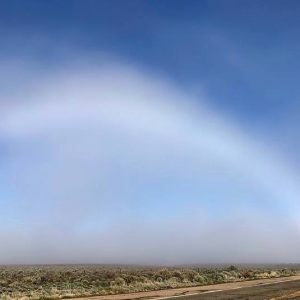 From the Haleakala Observatory on the island of Maui in Hawaii, the team will conduct their investigations at invisible wavelengths where heat is sensed. They’ve done this kind of study a few times already, singling out individual lunar locations to see how well they retain warmth throughout the eclipse. The whole character of the moon changes when we observe with a thermal camera during an eclipse. In the dark, many familiar craters and other features can’t be seen, and the normally nondescript areas around some craters start to “glow,” because the rocks there are still warm. How quickly or slowly the surface loses heat depends on the sizes of the rocks and the characteristics of the material, including its composition, how porous it is, and how fluffy it is. Lunar scientists already know a lot about the day-to-night and seasonal temperature changes from the data collected by LRO’s Diviner instrument since 2009. Those longer-term variations reveal information about larger features and the bulk properties of the top few inches of regolith. The short-term changes due to the eclipse will get at details of the fine material and the very top layer of the regolith. By comparing the two types of observations, the team is able to look at variations in particular areas — say, the lunar swirls at Reiner Gamma or an impact crater and the loose debris around it. These studies will help us tell the story of how impacts large and small are changing the surface of the moon over geological time. Bottom line: Scientists will use a thermal camera to study the moon during the lunar eclipse of January 31, 2018.